It’s bread making time! Recipe included. Yay! Well, if there’s anything that I’ve learnt about this blog writing malarkey, it’s that if you say you’re going to do something…then you’ve jolly well got to do it. Unless, that is, there is an wonderfully brilliant reason as to why you can’t. 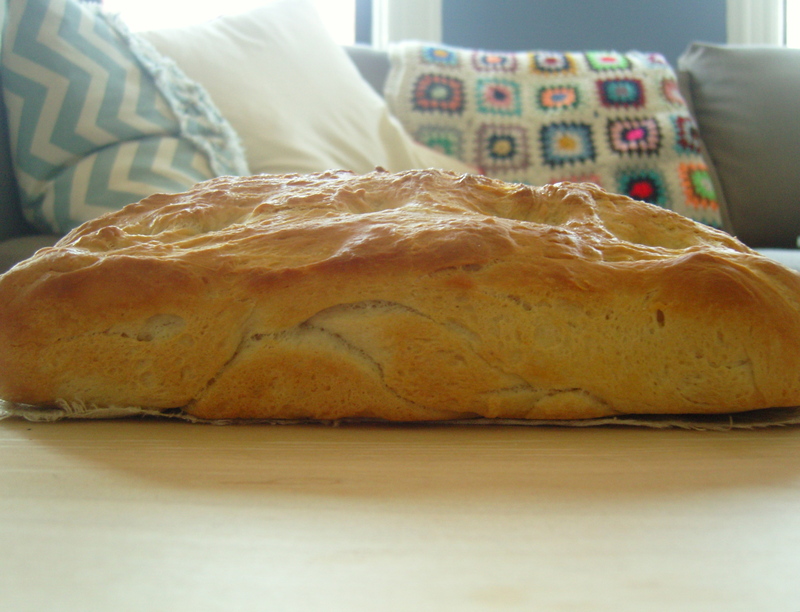 So when it came to tackling bread making, I was keen to find a way to wiggle out of it. In my head it was super complicated and difficult and let’s face it, I was a little bit afraid of miserable failure. Yup, self confessed slight perfectionist over here. Hmm. Anyway… the great news is that I was proven wrong (upon reading this I have noticed a completely unintentional bread pun. Score!). It was a doddle! The only difficulty was finding time to squeeze all the specific stages around Molly and her schedule. There was a point at which I was furiously kneading and singing endless rounds of Old MacDonald whilst Molly (who was fed up of being in her door bouncer at this point) kind of just hung there looking a little sad. Poor bean. Anyway, she survived and so did the bread. YES! 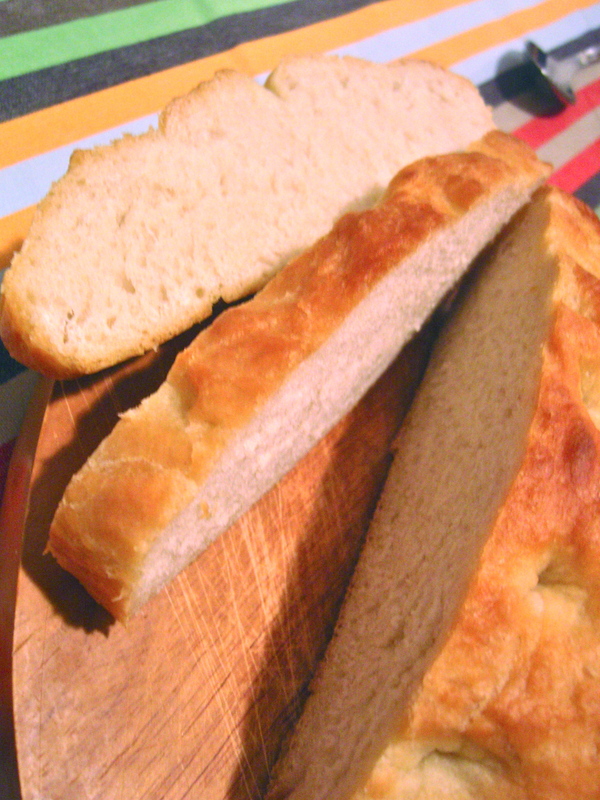 I’m a big fan of both ciabatta and focaccia, so decided that this would be a good place to start. 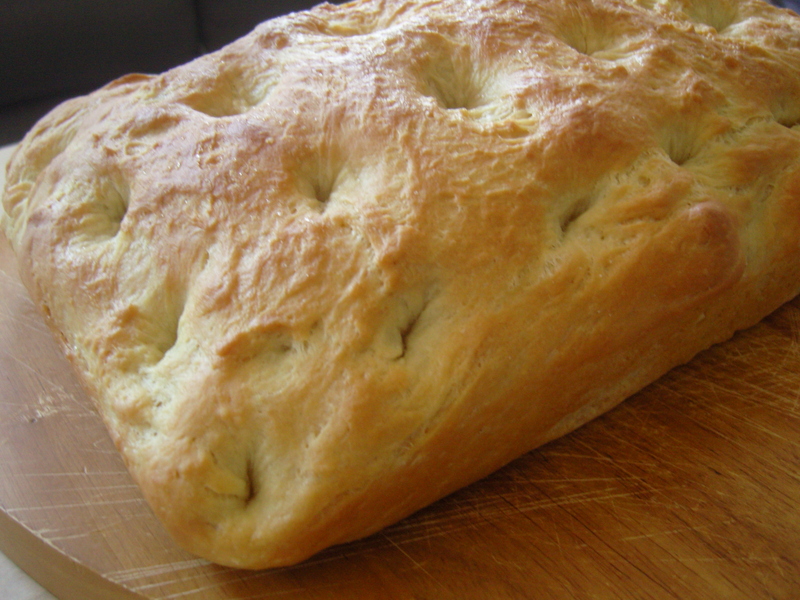 I followed a very simple focaccia recipe but didn’t dare to wander from the page and experiment with flavours. Next time though, next time! The end result was pretty darn delicious. 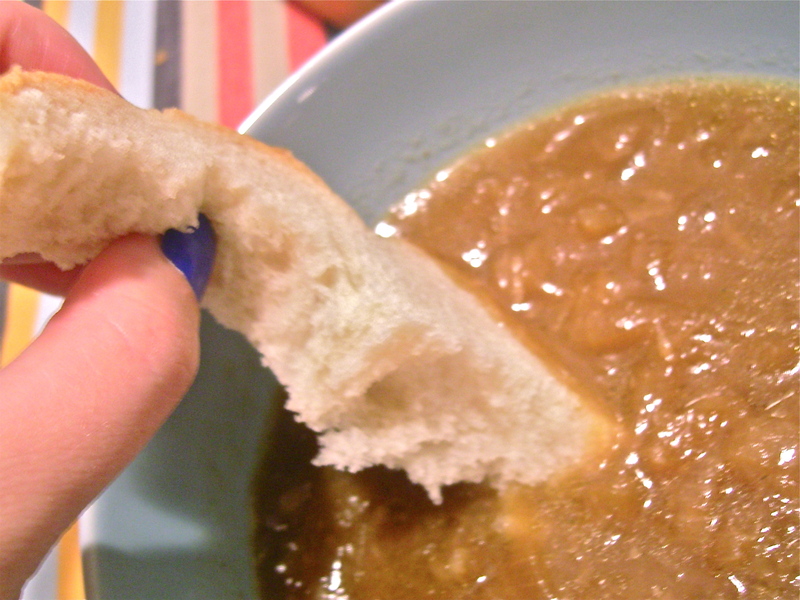 We had it with French onion soup (the making of which is a rather laborious task, but so worth it) and it worked quite well as toast for the next couple of days. Molly enjoyed it with some scrumptious blueberry jam made by our lovely friend Jo. Thanks Jo! Now, it really wasn’t perfect, no where near in fact. It was a little too dense. Now, I’m not sure if this was because I didn’t knead it enough or I didn’t leave it to prove for long enough, I’ll have to do some research into that for next time. 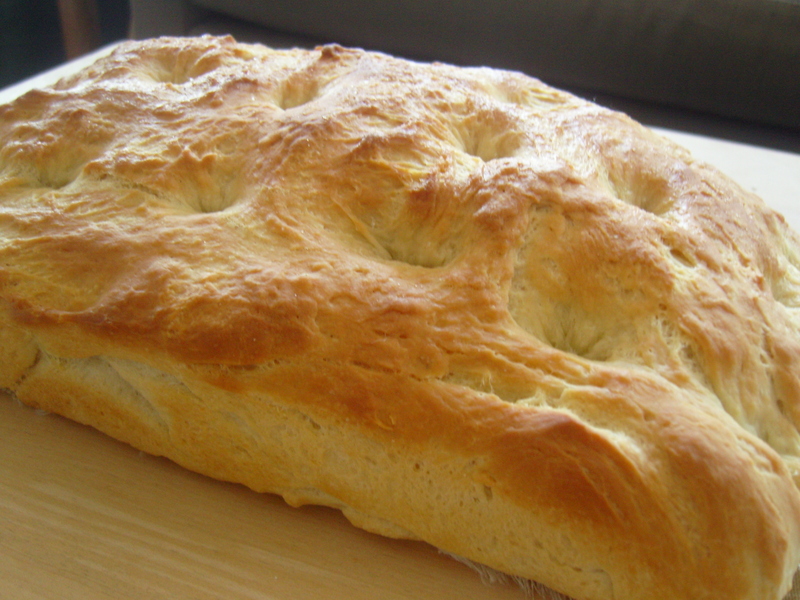 If any of you have any suggestions and tips on this whole bread making thing, I’d love to hear them. Nevertheless, for a first attempt, I was pretty chuffed with the outcome. 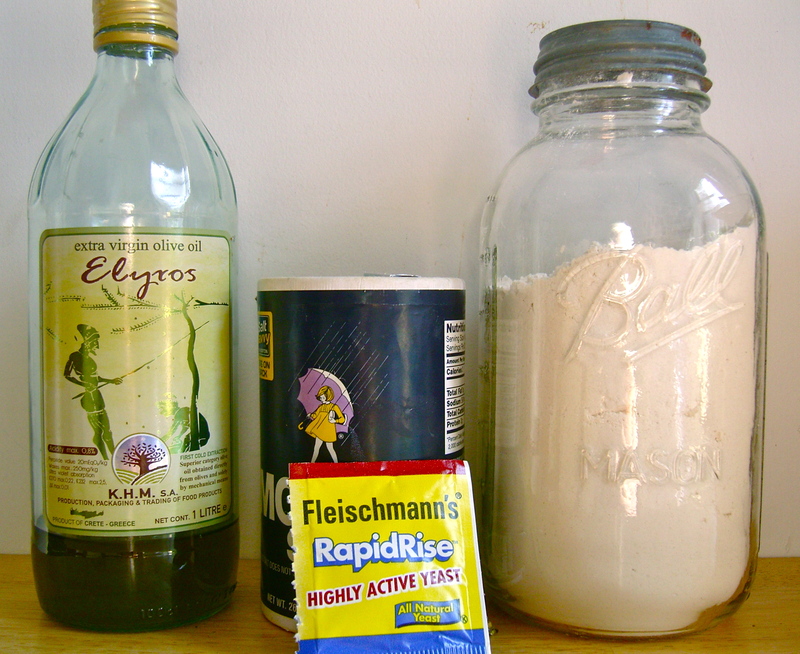 For any of you who interest in giving it a go… here’s the recipe. Be sure to send pics in! 1. 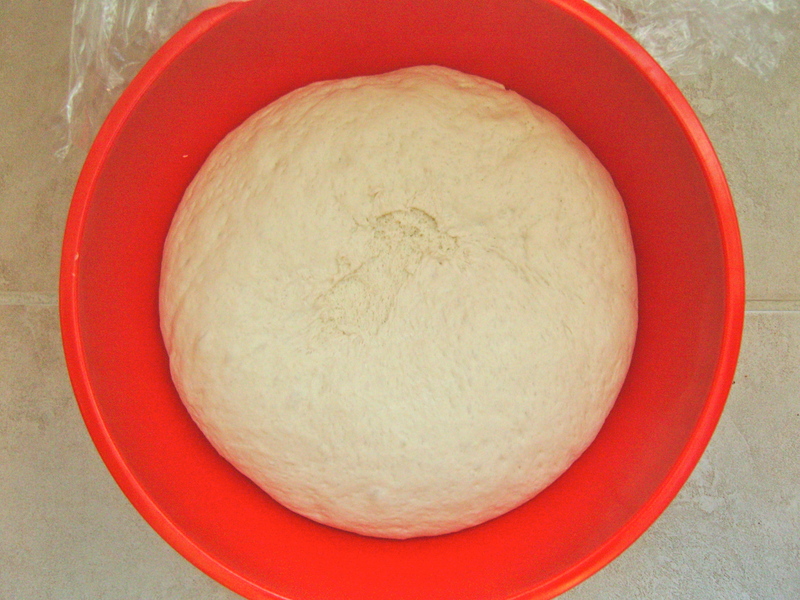 Sift the flour and salt into a large bowl, stir in the yeast and make a well in the middle. 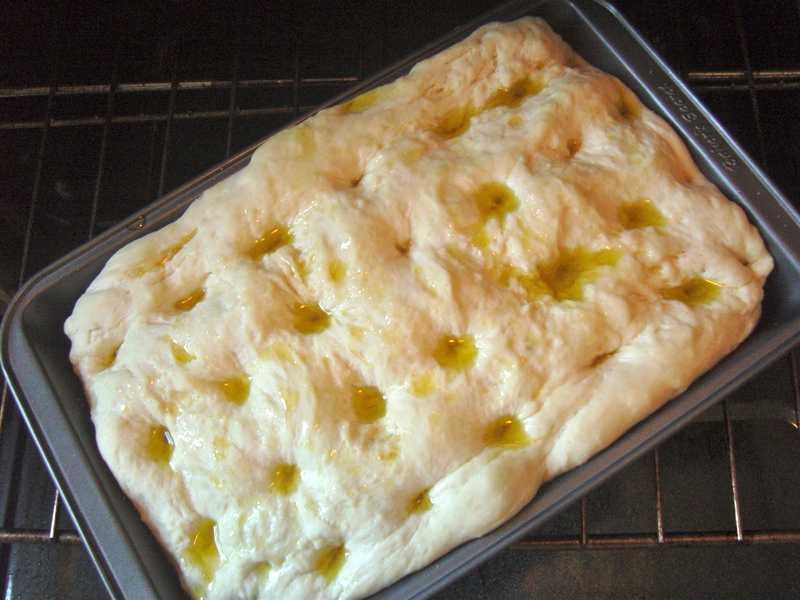 Work in 450ml (1/4 pint) warm water and the olive oil to forma soft smooth dough. 2. Knead for 10 minutes until smooth and elastic, then put in a lightly oiled bowl. 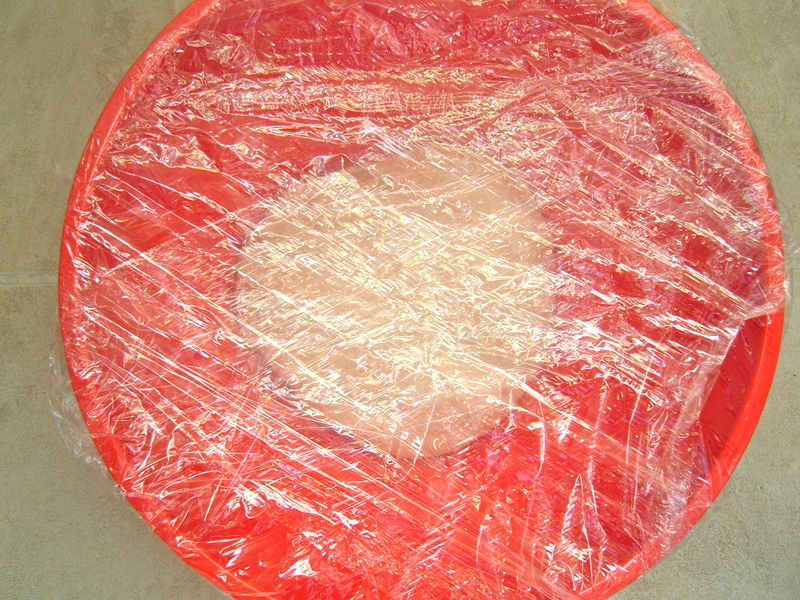 Cover and leave to rise in a warm place for 1 1/2-2 hours until doubled in size. 4. 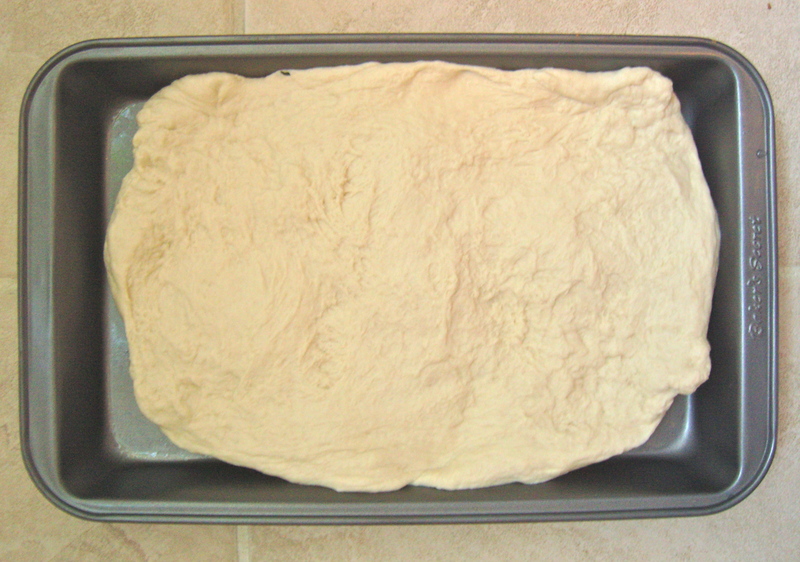 Using fingertips, make deep dimples all over the surface of the dough. Drizzle with 4 tbsp olive oil, sprinkle generously with coarse sea salt and spray with water. 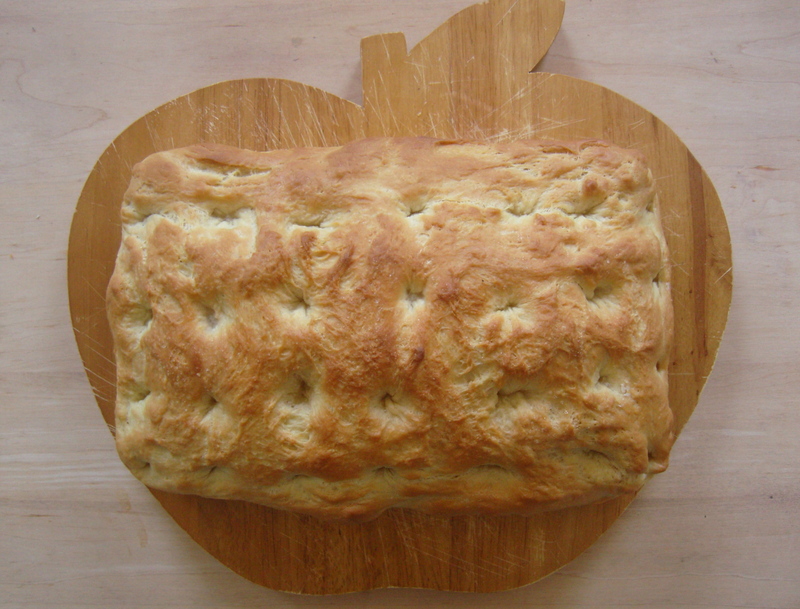 Bake at 200 c (390 F) for 20-25 minutes, spraying with water twice during cooking. 5. Transfer to a wire rack to cool slightly. 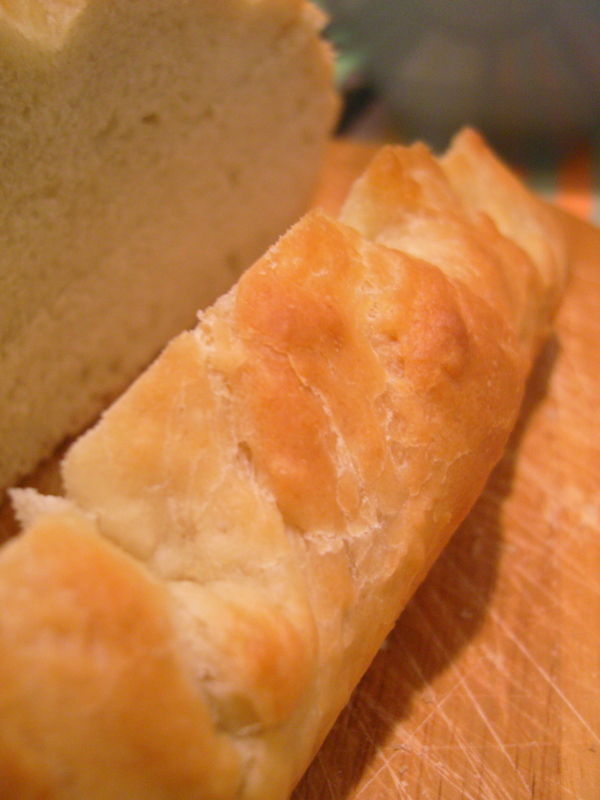 PLUS….I heard on the BBC’s mighty The Great British Bake Off, if you turn the bread over and knock on the bottom, a hollow sound will indicate that it’s done. If it sounds dense still, pop it back in for a bit. The bread needed so few ingredients. A big thumbs up! I love how it doubles in size…I mean, how absolutely genius is that?! I really didn’t do the best job of shaping it. Will try better next time. I’d give myself about a C for that. 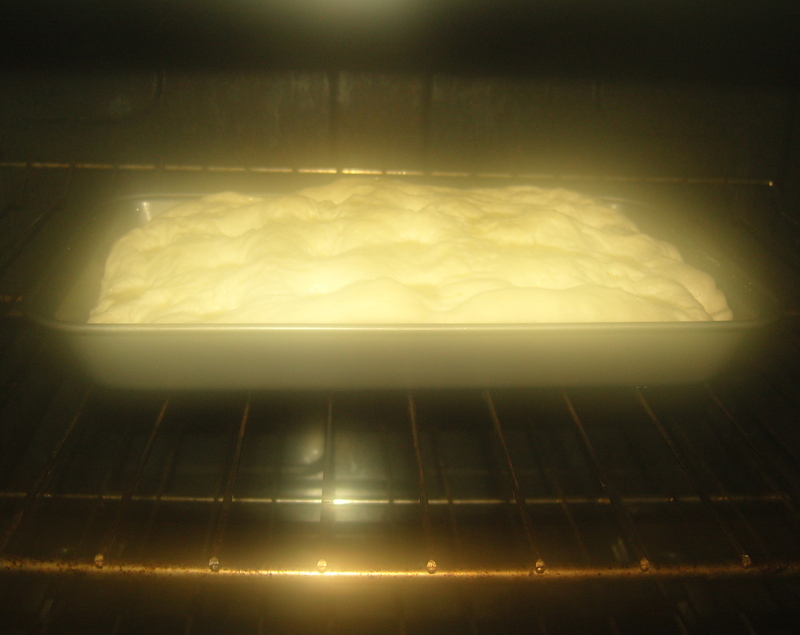 A quick snap shot before it goes into the oven….eeeekkk…. Love this photo of it looking as though it is going to heaven or something! Ha! And here it is! Crispy, yummy, goodness! At this point i had no idea what the inside was like. I was too scared to cut it. So I just took lots of pictures of it instead! 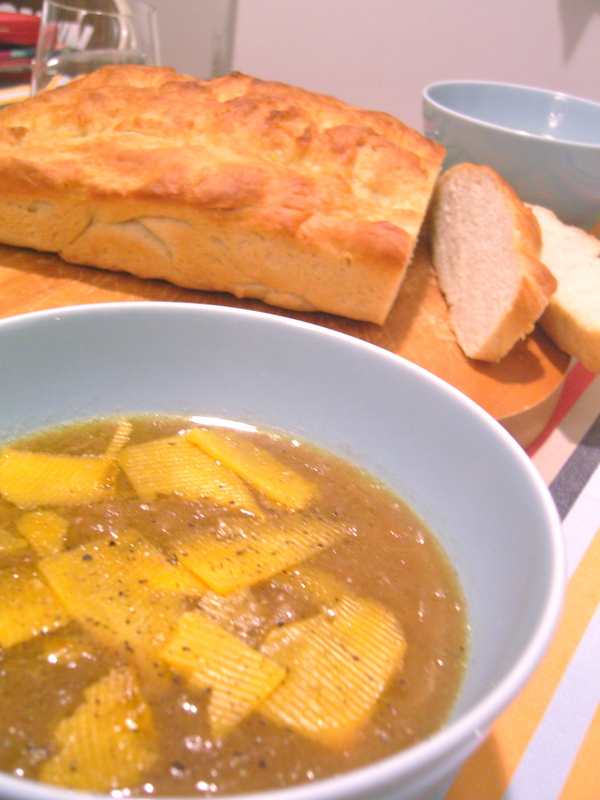 In the busyness of soup and bread making I forgot the topping for the soup…whoops…doesn’t look nearly as appetising with slices of cheese floating aimlessly on top….oh well! 30 Sep	This entry was published on September 30, 2012 at 1:23 am and is filed under Uncategorized. Bookmark the permalink. Follow any comments here with the RSS feed for this post. 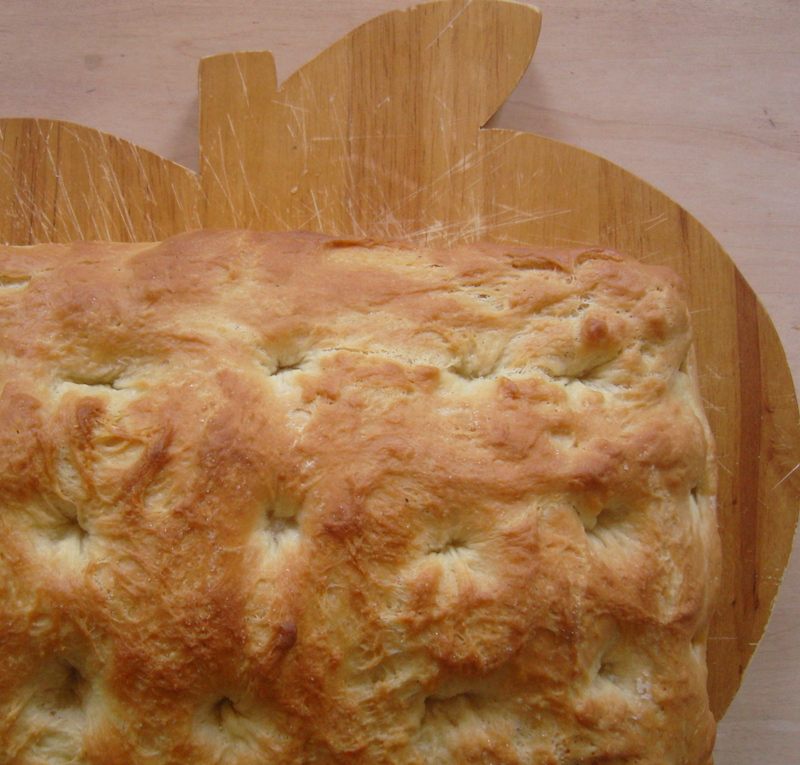 Older: A sneaky peek…and pie!